Ricci's love of flowers started at a very early age, when she would collage with her mother's garden and Martha Stewart magazines. Her BFA background in Art History and Photography serves as a powerful link to her creations. Ever-evolving, Ricci's aesthetic and inspiration is derived from English antique and vintage, the old masters, the photograph, and of course, seasonal blooms. When she isn't designing, Ricci can be found snacking around with her cat, Binx. 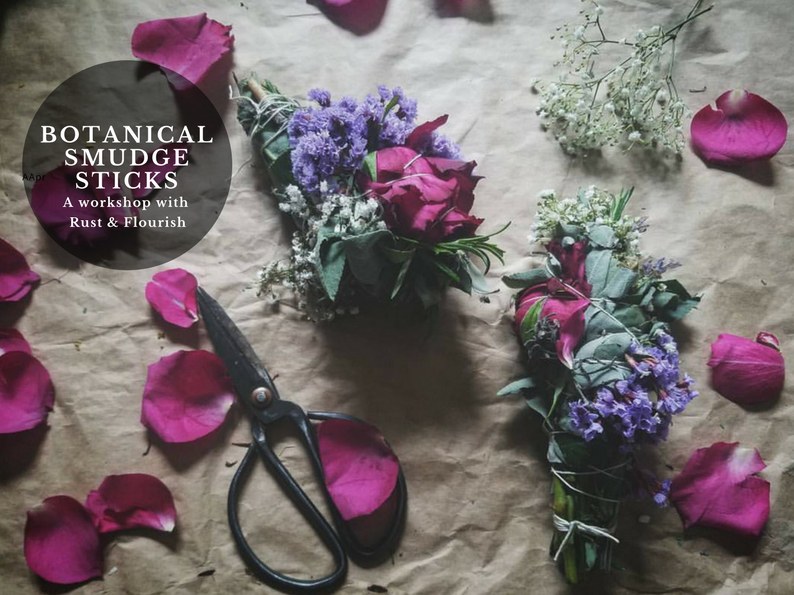 In this two hour class, all materials will be provided to make at least 3-5 smudge sticks with a curated selection of our magical gemstones that you can tie to your wands (up to 4), or set in your space for burning. During the class we’ll have wine + beer, yummy snacks and you’ll get a discount on merchandise in the store that night. We entwine, forage, and burn our special smudge with intention and purpose! Join us to learn about some of these healing purposes and use them for yourself!